I had a bunch of leftover veggies from our Bountiful Basket one week, including these gorgeous rainbow carrots. I got some stew beef at the market and put that in the crock pot with some flour and made sure the meat was lightly coated in flour. 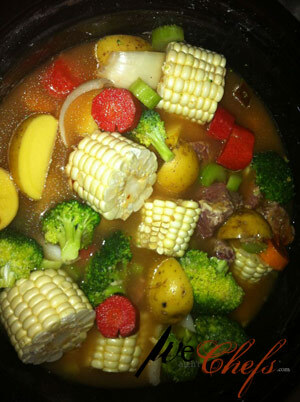 I cooked the meat a bit then added in broccoli, rainbow carrots, white potatoes, chunks of corn on the cob, onion, celery, garlic, kosher salt, black pepper and two cans of beef broth. I then just let it cook all day long in the slow cooker. You may have to add more liquid throughout the day, I just use water at that point. The meat fell apart in the stew it was so tender. I was able to store the leftovers for another quick, easy meal. This past weekend, I made this again and used up the veggies from my basket which included brussel sprouts and fresh green beans. My kids and husband had no clue they were eating brussel sprouts, loved it!